Squash. I know, the word is weird and makes your mouth turn up on one side, but I like squash. One of my all-time favorites is Butternut Squash, maybe because of the memories and the story that is attached to it. When I was a little girl for a snack my mother would cut a butternut squash in half and put it flesh side up in our gas oven to bake. It would get soft and brown and beautifully caramelized. Mom would take it out of the oven put some butter and salt on it and smash it up in the shell. Then we would use spoons, not forks, to eat it. It was like hot ice cream, sweet and salty. When I make it in my own kitchen the memory of my mother, the old farm kitchen, and that ancient gas stove come back to me. I close my eyes when I take a bite and for a few moments, I am a little girl again. What garden food reminds you of a story and takes you back home again? Write it down and tell your kids about it, or better yet, get that food and relive the memory with them. Tell me about it here in the comments, I’d love to hear the story. Merry Christmas and Happy Celebration!! I thought you might enjoy a favorite holiday cookie recipe, Chocolate Jumbos. They are a chocolate spice cookie with a butter cream frosting. They have a hole in the middle — and they just don't taste right without that hole. Even as I write this, my mouth begins to water for the taste of those cookies. The recipe has been in the family since the 1800’s. We always make Chocolate Jumbos during the holidays and even now these cookies remain a family favorite. Recently my youngest daughter called me and said, “Mom, I want to make Chocolate Jumbos with you. I want to learn how to make them properly.” That made me feel good within my soul. To spend the time with my daughter carrying on a family tradition makes these cookies a taste of the past, the present, and the future. This recipe is all we ever had to go by — just the ingredients, no other written instructions. I did make my own changes. I only use butter, no shortening. My mother always rolled out the cookies with her rolling pin and used a biscuit cutter to cut them out into perfect circles. I have added my own flare by using a scoop. 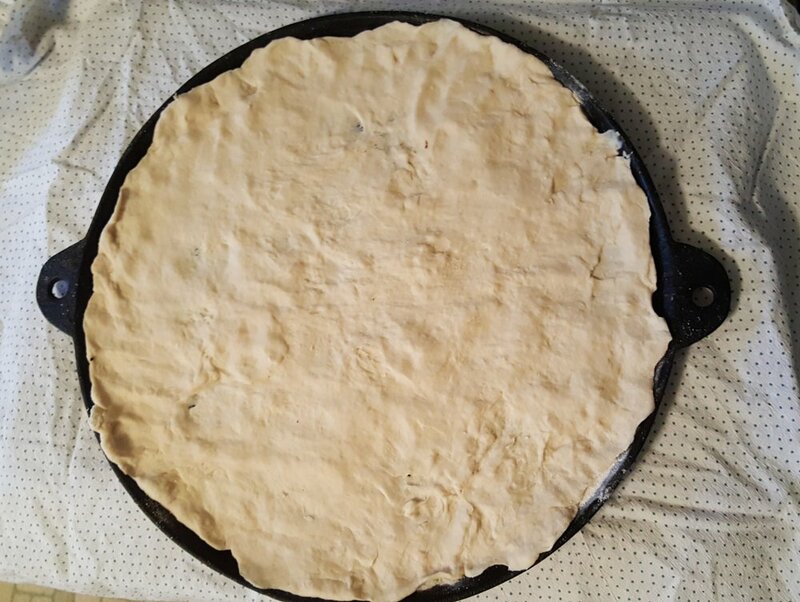 I scoop out the dough, put it on a cookie sheet I have sprayed with cooking spray, then flatten the dough with my hand. Using the handle tip of a wooden spoon, I swirl in a hole. Have fun!! I truly hope you enjoy these cookies as much as my family does; a part of my life I share with you. I made pizza tonight for supper. It is really quite easy to do. This is a recipe I have been asked about several times so I thought I would share it this week. I’ve included two recipes for the dough. I use recipes as a guide more than an exact model. Notice in both recipes you start with yeast, a type of sugar such as honey or table sugar, and warm water. Let’s talk about the sugar. You need a little bit of sugar to get the yeast working. Artificial sweeteners will not work, nor will Stevia. You need sugar for the yeast to feed on and activate the bubbles. It could be molasses, raw sugar, granulated sugar, honey; it is your choice but it needs to be a type of sugar. Dissolve the yeast in the water and sugar, then dump everything else in and mix it all up using your hands or a KitchenAid mixer. My sister uses her bread machine, then she stops it and takes the dough out. You can make extra dough, too, and put it in the freezer in a ziplock bag. Let it thaw before you use it. In the past, I used to let the dough rise once in the bowl, punch it down and knead it again, but I don’t do that anymore. Now I let it rest in a ball in the bowl while I get out my baking dish and spread cornmeal on it (no oil). The cornmeal makes the crust brown and crispy on the bottom. Then I press out the dough and let it rise for a while while I get on with my day. After about 2 hours or more (seriously, I never time it) I put the crust in the oven on 350F for about 10 minutes (I do time this part). Baking the crust for a few minutes before adding toppings helps it to not be gooey in the center. After the 10 minutes, take it out of oven, pour on spaghetti sauce (homemade or from a jar, it doesn’t matter) and spread it evenly, then add the cheese. I use whatever cheese is in my fridge and I don’t measure any of it; I just do it until it looks good to me. I cut up all sorts of vegetables; onions, peppers, olives, etc., and throw them all on, sprinkle on some Italian seasoning and bake it in a 425-450F oven for about 10 more minutes. You just have to keep checking it to make sure it is cooked to the point that you like. My family tends to like the cheese a little brown. Well, that’s a bit about my process when making pizza. Give it a try and tell me how it goes.